Campfire Games, the developer of the American Civil War online multiplayer game War of Rights is currently looking to fill the position of being the team’s UI Engineer. Your primary task will be to expand the UI of the game with new features as more content is added throughout our Steam Early Access period. General bug fixing and improvements to the usability based on feedback from our playerbase is also going to be a central task. • Develop, test, maintain and optimize the UI to work efficiently and effectively using CRYENGINE and Flash. • Complete tasks in a timely manner and to a consistent high quality standard. • Write clear, maintainable and portable code. • Document source code, and write test cases when necessary. • Work very closely with Programmers, Concept Artists and other Engineers. • 1+ year of professional or 3+ years of educational experience, preferably in the games industry. • Strong software engineering and debugging skills. • Experience with writing custom controls, skins and other advanced UI features. • Some knowledge of 3D math. • Experience with CRYENGINE. With good understanding of UI Elements, Modules and Actions. • Team player and self-driven. • Solid English skills and strong communication skills. • Excellent understanding of Adobe Flash and Actionscript. • Bachelor degree in Computer Science, a similar degree, relevant course or comparable experience. 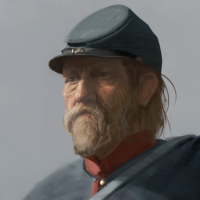 Joining Campfire Games will get you on a highly passionate dev team with more than 6 years dedicated to War of Rights already (War of Rights is the first game by Campfire Games), a successful Kickstarter campaign, a several year-long crowdfunding campaign, a recent launch on Steam Early Access and a very dedicated alpha community. We are currently pushing out patches at a regular interval (once a week roughly), so it is important to keep your work ready for customer feedback from an early stage. Campfire Games consists of 13 people spread out across the world. We have an office in Denmark but the majority of all team members are remote workers, working from home. This allows us to be very flexible in terms of our work hours (there are no set times you have to work). The external work relation naturally comes with a great deal of trust between the work parties and we expect you to be very self-driven which is particularly needed when working remotely. We’re able to offer anywhere from a part-time to a full-time position. Please send your application to applications@warofrights.com and we will get back to you. If selected as a candidate for the position you may be invited to a technical interview as well as presented with a trial task.